Imelda May’s hair roll set’s her apart for many other musicians. 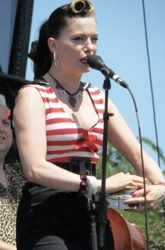 Imelda Mary Higham (born Imelda Mary Clabby on July 10, 1974 in Dublin), is known as Imelda May. The award winning Irish musician, producer and singer-songwriter’s hairstyle is a throwback to the 50s with her front hair quiff style hair roll and her array of rockabilly ponytails. Imelda make her hair roll pop by highlighting the front of her hairline where she creates the roll. She usually pulls her matching ponytail tightly back from each side of her head to give her hair roll even more prominence at the top of her hairline. Although known primarily as a singer with a iconic stage performance and unique hairstyles, May also plays the bodhrán, guitar, bass guitar and tambourine. Described as “a unique vocal talent,” May is known for her musical style of rockabilly revival and has also been compared to female jazz musicians such as Billie Holiday. Many fans of Imelda May’s hair roll want to learn how to re-create the singer’s hairstyle on their own hair. In order to create the rolled hairline quiff, you need to be able to separate out a square section of hair which is 8 centimeters long and about 1/2 to 1 inch in depth adjacent to the forehead. 1. Cleanse detangled hair in lukewarm water utilizing your favorite methodology such as Full Shampoo, Diluted Shampoo (DS), Conditioner Only (CO), Water Only (WO), Low Poo or a combination. 2. Rinse completely. Do a gentle accordion finger squeeze completely around your head to remove excess water. 4. Apply a rinse-out conditioner unless your hair is fine or thin. Focus the conditioner on the areas of your hair which are dry or need the most hydration. 4. Detangle conditioner coated hair in individual 2″ sections working from the ends to the roots using fingers or hair friendly wide tooth comb. Work slowly since hair is most fragile when it’s wet. 5. After detangling hair completely in the shower, completely rinse out the conditioner. 6. Finish with a cool or cold water rinse. Do the accordion squeeze to remove excess water. 7. Towel blot to remove excess water. 8. Apply desired leave-in styling cocktail to damp hair and distribute well. Add a defrisant to prevent frizz. 9. Using a long tailed comb, section off a square of hair directly adjacent to your forehead. The section of hair should be approximately 8 centimeters long and 1/2 to 1 inch in thickness. 10. With a 100% boar bristle round brush and a blow dryer, direct the hair around the brush and blow dry into a front curl. When hair is completely dry, pin into place. Work on drying the rest of the hair. If you prefer, you can use your fingers and wrap the hair into a curl and directly the dryer to the curled hair. 11. Separate the rest of the hair out from the curl section into 4-6 equal sized horizontal sections. 12. Keep hair separated into individual sections and blow dry straight with a boar bristle round or paddle brush. 13. Once hair is 100% dry separate hair into individual 2″ sections. 14. Run a flat iron from the roots down to the end to add sleekness. 15. Using fingers or a boar bristle paddle brush, direct all of the hair around the hairline, except for the top curl, towards the back of the head into a ponytail. Pull the hair tightly. 16. Create the ponytail base halfway between the top of the crown and the nape of the neck at the middle of the back of the head. 17. Use a hair-friendly elastic like a Blax or Bungee to secure the base of the pony. If you prefer, you can pull on strand out from the tail and wrap it around the base and secure. 18. Use fingers to smooth the back of the ponytail or run the flat iron over the middle to the end sections to smooth and add sleekness. If you prefer, you can use a curl iron to create loose curls, waves and edgy texture. 19. Apply 1 or 2 drops of shine serum to the palms of my hands and massage together. Light brush the palms of your hands over the pony to add shimmer. 20. Finish with a spritz of hairspray if you wish to add hold. 21. Unpin the front curl. 22. To create a more pronounced curl, curl with a 1 1/2 to 2″ curling iron. 23. Once the curl has been formed, re-roll with fingers and pin into place to cool and set. 24. After the curl has cooled, unpin it and back brush to create a tighter curl. Lightly smooth the teased hair back and mold into a curl. 22. Spray hairspray onto the finished curl to create hold. 23. Anchor the curl with a bobby pin. Imelda May is famous for her incredible musical talent and for her signature hair roll which she highlights to make it pop. Imeda May is a wonderful throwback to the 50s with her stunning fashions and rockabilly hairstyle. This entry was posted on Tuesday, August 12th, 2014 at 9:31 pm	and is filed under Hair. You can follow any responses to this entry through the RSS 2.0 feed. Both comments and pings are currently closed.